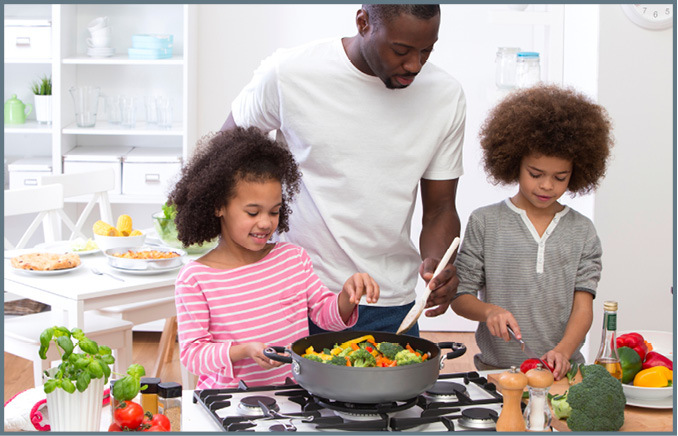 Research shows that families with cooking skills are more likely to make healthier food choices. Basic cooking skills are a must when cooking for yourself or others, especially family members. These skills provide a foundation for all family meals. Research shows that families with cooking skills are more likely to make healthier food choices and spend less money every month on food. Three simple cooking basics will help put tasty, healthful meals on the table easily. • Plan meals. Taking the time to plan simple meals for the week saves time, money and frustration. - Create a binder to store your weekly meal plans and recipes. After you’ve created a few meal plans, start over at week one. • Find family-friendly recipes. After you find several recipes your family likes, cooking becomes easier. Keep ingredients for these recipes in the pantry for when you may need to make quick adjustments to meal plans, such as a change in schedule or someone voices a preference for a “favorite” recipe. - Don’t have many recipes on hand? Or are you short on time? Check out our “Now Serving” publications for a series of menu plans and budget-minded meals. • Shop with a grocery list. Some people do not enjoy grocery shopping. To make it less of a chore, always use a list based on the week’s menu plan. - Check your pantry, refrigerator and freezer before shopping; you might be surprised at what you find. - Read sale ads to see the “specials of the week.” Perhaps tortillas and chicken are on sale. Consider making chicken enchiladas for dinner this week. - Consider how you might supplement your meal plan with items from your own or a friend’s garden, or make a trip to a local farmers market. Question: I use a lot of packaged foods such as rice or pasta mixes when serving my family dinner. I’ve heard they’re often high in sodium. What could I use in place of these packaged side dishes that still have flavor and are not time-consuming to prepare? • Veggies of all colors: Veggies are a quick side-dish addition to any table. Try them raw, steamed, stir-fried, grilled or roasted. Add a salad to your menu in addition to a vegetable. A variety of greens mixed together with a bit of dressing is a delicious and colorful side to any meal. • Pasta: Saute cooked pasta with just a splash of oil and garlic as a tasty side dish that any member of the family would enjoy. Try adding a teaspoon of Parmesan cheese for extra flavor. • Rice: Try brown rice for a nutty flavor. Cooking rice in reduced-sodium chicken broth or tomato juice instead of water enhances flavor. Or mix it with salsa for a great Tex-Mex flavor. “Kids a Cookin’” is a great site to find ideas on how to prepare easy recipes. Need a recipe? Don’t know what the term “braise” means? Grab your kids and check out the website. Cook chicken in a skillet with chicken broth. When chicken is cooked through, add the carrots, soy sauce and garlic and stir together thoroughly while adding ginger. If desired, add bouillon granules (optional – this increases sodium content). Cover and allow the vegetables to cook, stirring occasionally until the carrots begin to fry. Add broccoli and cook just a few minutes, stirring continuously. Serve immediately. Each serving has 170 calories, 3 grams (g) fat, 25 g protein, 10 g carbohydrate, 3 g fiber and 290 milligrams sodium. Quick Tip: Having chicken again tomorrow night? Cook an extra chicken breast or two tonight to save on cooking time tomorrow.